Frank O'Hara (1926-1966) was a dynamic leader of the "New York School" of poets, a group that included John Ashbery, Barbara Guest, Kenneth Koch, and James Schuyler. The Abstract Expressionist painters in New York City during the 1950s and 1960s used the title, but the poets borrowed it. 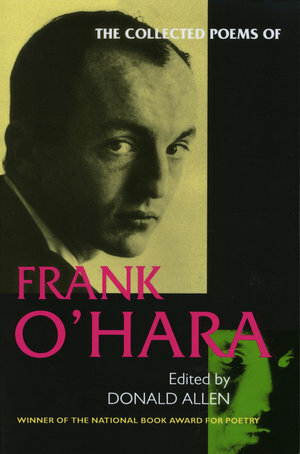 From the beginning O'Hara's poetry was engaged with the worlds of music, dance, and painting. In that complex of associations he devised an idea of poetic form that allowed the inclusion of many kinds of events, including everyday conversations and notes about New York advertising signs. Since his death in 1966 at age forty, the depth and richness of his achievements as a poet and art critic have been recognized by an international audience. As the painter Alex Katz remarked, "Frank's business was being an active intellectual." His articulate intelligence made new proposals for poetic form possible in American poetry. Donald Allen (1912-2004) was Director of Grey Fox Press. Among the literary collections he has edited are The Postmoderns, The Poetics of the New American Poetry, and The Selected Poems of Federico García Lorca; he is the translator of Four Plays of Eugène Ionesco.